Did you know that a majority of real estate agents claimed that houses with wooden floors sold faster than those with tiles? The main reason for such high preference for wooden floors is due to the durability, comfort as well as a sense of beauty and warmth offered by these floors. Today, hardwood floors are affordable and also come in a variety of styles, designs and colors. In addition to this, taking care of wooden floors has become an easy job, what with the introduction of several cleaning products. And since wood is a natural resource, the floors are both renewable and recyclable. Factory finished, unfinished, engineered, solid, plank, acrylic, strip and parquet - you can choose from a range of hardwood floor styles. One can also choose from a wide range of colors from dark shades to very light ones. In addition to this wooden floors can be painted as well as stained. Hardwood floors are typically about ¾” thick planks with the rich warmth that comes from oak, maple, birch, cherry and other wood varieties. These planks must be nailed down and are not recommended for use in areas that are lower than ground level. Hardwood flooring is more expensive to buy and install. It is easily susceptible to scratches and shows signs of wear on exposure to excess moisture and high traffic. Durability and ease of maintenance make for hardwood flooring as a material of choice. They can be customized with options for staining and painting finish. You can match them to your furniture and accessories. But hardwood floors can be refinished with sanding. Consequently they last years unlike laminates that don't lend to repair easily. Hardwood doesn't trap allergens and pollutants. 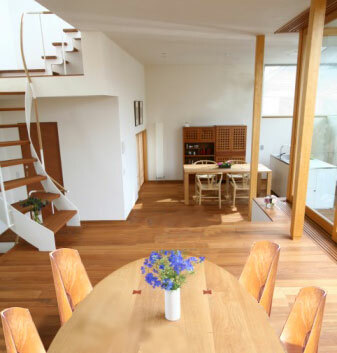 It is always best to follow the manufacturer's cleaning guidelines with regard to wooden floor. Maintaining hard wood floor is also quite easy. Regular maintenance includes sweeping with a soft bristle broom and vacuuming with a soft floor attachment. Buffer can be used to retain shine. Waxing can be done once or twice a year depending on the usage. You need to wash the high traffic areas twice in comparison to low traffic areas. Rugs or door mats can be placed on both sides of the doorways, which will help in trapping dust and thus prevent scratching. Rugs should also be placed in high traffic areas. Be careful not to use sport shoes with spikes as well as high heels as this may scratch or dent the surface. Your pet's nails may also need to be trimmed regularly. Do not drag, push or pull any heavy equipment or furniture on the wooden surface. Wipe up any spills immediately and do not allow water to stand on the floor. Take care not to over wax the wooden floor and do not use tile floor cleaning products on the wood. Be careful about wax build up beneath furniture. Check with your dealer for urethane finish wooden floor as this type has the capacity to stand water as well as high traffic. This type is best suited for kitchens and other highly used areas. And do not wax a urethane finish wood floor. Another major advantage of wood floors is that, wood does not harbor dust, dirt, bacteria and other microorganisms, thus preventing various kinds of allergies. By following these basic do's and don'ts, you can easily maintain your wooden floor. A regular and proper cleaning routine will help your hardwood floor to last a lifetime. First Published Date: Jan 27 2007 Last modified Date: April 18 2019 This page may have been updated recently as new information is available or the content may have been edited for better readability.